THIS IS THE WORST KIND OF A SHATTING MONTH... WHEN THE FIRST SUNDAYOF THE MONTH IS TEH FIRST OF THE MONTH.. IT IS LIKE THE MONTH IS 7 DAYS SHORTER THAT WE ARE USED TO..
WE DID HAVE A BUNCH OF PEOPLE BUY BRICKS YESTERDAY SO WE ARE ALMOST THERE..MAYBE ON A MONTH LIKE THIS , I SHOULD WARN EVERYONE AND HAVE YOU REALLY WORK ON "ONE MORE VIEWER" ... WHO WOULD HOPEFULLY BUY ONE BRICK !! THESE ARE A LOVELY BUNCH OF PUPPIES !! MAYBE A FEW ARE A LITTLE TALLER THAN I HAD PLANNED ... BUT NOT BAD STILL HEAVY BONED..... I THINK TONY AND GROMMET ARE SHORTER SO MAYBE WE AN WORK THEM INTO THE LINEUP. SITTING ON THE FLOOR IN THE VETS OFFICE WHILE THESE PUPS COME OUT OF ANESTHESIA IS INTERESTING.. REGARDLESS OF WHAT ANYONE TELLS YOU, HEAT RISES AND THE FLOOR IS COLD ! DANVERS ANIMAL HOSPITAL HAS A MASSIVE SUPPLY OF FLUFFIES AND BED SPREADS BUT EVEN SO.. I KNOW THE USUALL PROCESS IS TO PUT A DOG IN A CAGE AND SO AS THEY AWAKE THEY CAN'T FLAIL AROUND TOO FAR..-- BUT I HAD A PERFECT DOG "BROWNIE" -- WHO TEMP. WENT TO PENNA WITH A HAPPY TAIL WHICH THEY NEEDED TO CROP. AT MAILCALL LAST NIGHT WE GOT A PACK OF PAPERS I DID NOT UNDERSTAND FROM LUDLOW MA... AFTER MAIL CALL, I SPENT SOME TIME FIGURING IT OUT.. APPARENTLY THERE IS A NONPROFITFACTS.COM-- MAYBE YOU ALL KNOW ABOUT IT-- BUT IT WAS NEW TO ME.. IT HAS TEH BASIC INFORMATION OF OUR 990 FORM WHICH IS FILED WITHTHE ATTNY GENERAL OFFICE IN MASS.--- IT IS ALL PUBLIC INFORMATION... I DID NOT SEE THE QUESTION ABOUT "DO YOU NOW, OR HAVE YOU EVER RUN A TANNING BOOTH" WHICH IS ON THE 990.. BUT IT WAS THE SAME KIND OF STUFF. AGING IS NOT FOR THE MEEK... WE KNOW THAT-- IT IS BAD ENOUGH THAT GEORGE(DVM) IS SEMI RETIRING - I FOUND OUT YESTERDAY THAT JIL-- THE NIEGHBOR WHO CUTS MY HAIR ( IN THE LIVING ROOM OR T TENT---) IS RETIRING, BUT SHE SAID SHE WOULD STILL CUT MY HAIR. I SUPPOSE IF YOU HAVE A MOTHER OR GRANDMOTHER----SOMEONE WHO SEEMS TO HAVE EVERYTHING..A PAIR OF SUPER SCISSORS WOULD BE ONE OF THOSE THINGS MOST PEOPLE WOULD NOT BUY FOR THEMSELVES..
MY ANTIQUE LEVER ARM PAPER CUTTER IS ONE OF MY MORE PRIZED POSSESSIONS- IT CUTS !! AND IS GIVEN A SPECIAL PLACE UNDER EITHER THERESA'S DESK OR MINE. Fidelco has been advised by its veterinary community that there is a potentially dangerous, and even lethal, presentation of canine influenza in the central and northern Connecticut region. At Fidelco, we’re exercising an over-abundance of caution. All off-campus training in the community is temporarily suspended. All puppy classes are canceled this week, too. We advise all dog owners to keep their dogs at home and in their own yards; limit exposure to other dogs; and avoid all dog parks for the next several days. If you observe any of these, please call your veterinarian immediately. IT IS AN ARCHETECH'S RENDITION OF THE BUILDING THAT WAS MISSING.. I HAD DONE A GRAP PAPER DESIGN AND IT WAS NOT APPROVED...SO I HAD TO HIRE AN ARCHETECK TO PUT MY SQUARES ON HIS PAPER.. I WANTED VERY BADLY TO SAY "?WHAT DO Y OU NEED THAT FOR, IT IS MY BUILDING AND WHAT HAPPENS IF WE CHANGE OUR MINDS AS WE GO ALONG?" WHICH IS THE WAY BUILDING ANYTHING USUALLY GOES AROUND HERE.. BUT I KNEW THAT WOULD JUST HOLD UP THE WHOLE PROCESS.. WHICH IS ALREADY 3 WEEKS BEHIND. IF I HAD BELIEVED THAT FIRST SECRETARY WE WOULD BE IN WORSE SHAPE..
AND THEN THERE WAS THE IPSWICH POLICE STATION... IN THIS AREA POLICE STATIONS ARE SET UP TO ACCEPT MEDICINES/DRUGS/ AND SYRINGES--SEVERAL TOWNS I KNOW HAVE A MAILBOX ARRAINGEMENT - WE HAD 4 GALLONS OF SYRINGES TO GET RID OF- AND I WENT IN.. NO ONE AT THE COUNTER - BUT IN THE BACK WAS AN OFFICER- WHO TOLD ME TO DEPOSIT TH E SYRINGES IN TH E LITTLE HOLE - I SAID I HAD A QUANTITY-- SO HE TOLD ME TO PUT IN SOME AND COME BACK AND DO THE REST LATER. I DECIDED TO TAKE TH TOP OFF THE SCRAP BASKET THING... AND MY HANDS JUST WOULDN'T-- SO I ASKED FOR HELP-- AND HE SAID " NO " . IT IS A GOOD THING I DON'T GO THERE OFTEN..
NOW SHE HAS A FINE.. BECAUSE EVEN TO REPLACE THE DIRT IN THE HOLE, SHE HAS "DISTURBED THE SOIL WITHIN 200 FEET OF THE RIVER" . I IMAGINE 100% RETIREMENT COMMUNITIES WOULD BE EVEN WORSE..WHY DO PEOPLE FIND IT NECESSARY TO PROVE THEY CAN HAVE CONTROL OVER ANOTHER PERSON?? I SEE IT ALL THE TIMES WITH THE DOGS... AND THEIR DOMINANCE ..--- WITH THE DOGS, IN TH E WILD, ONLY THE 2 DOMINANT IN THE PACK ARE ALLOWED TO BREED. HOW DO I APPLY THAT TO NEIGHBORS. I CANNOT SEE WHAT LOGIC WOULD APPLY TO THE OLDER COUPLE WHO APPARENTLY CAN SEE THE DIFFERENCE BETWEEN 192 AND 200 FEET FROM 500 FEET AWAY. --- OR MY NEIGHBORS WHO DO NOT WANT ME TO USE MY DRIVEWAY. BEFORE WE BOUGHT THIS LAND WE LOOKED AT A NICE OLDER FARM IN BOXFORD- AND WERE SERIOUSLY CONSIDERING IT UNTIL I FOUND IT WAS INTHE HISTORIC DISTRICT AND I WOULD NEED TO GET PERMISSION TO DO ANYTHING LIKE HANGING A SHUTTER ..AND ALL PAINTING HAD TO BE APPROVED. FROM MELISSA-- ROGUE IS A BALANCE/SOUND ALERT SERVICE DOG. hi. just a quick update check in.. rogue is doing wonderful and never disappointing. she loves to follow me every where I go. i dont have very interesting stories right now. with 4 kids we have been hanging out at home and going for walks and playing in the yard. rogue is alway well behaved every where.. she has matured and not so responsive to other service dogs we encounter but she does not like other dogs or strangers near me or the kids.. she adores the kids! Rogue really loves to work and is always ready to do what is asked. She is better about alerting me to sounds and she follows me around everywhere outside. She is very smart and thinks! She also continues to be very insisting to lick my feet where I have nerve pain from neuropathy and cyst. She will push my feet if I have socks on. She seems to know when they really bother me. She keeps a close eye on me and when I need any support for balance she is right there. I will try hiking again this summer and rogue will be right by my side. She really is my best friend and the kids adore her! She still focuses when we are all out even if my kids touch her but if a stranger tries she will move away. People are so clueless and I still have the occasional ignorant person who insist on trying to pet behind my back but rogue let's me know they are there. Sorry we have not visited during the winter. It was difficult with 3 running busy kids and a baby. My 3 yr old is in the tantrum stage and just makes it hard to do things without john to help with the 3 yr old. We will try to come one Sunday soon since the weather is better. Rogue would love to visit! She has a vet appt for her annual physical and needs a few shots soon. So far she eats and poops perfectly and no vomiting. Seems very healthy and a strong stomach! She is very good! Thank you again for the privilege of having another service dog. ANNIE I knew her so well and I knew what she liked or what she was scared of and what she was trying to tell me. ROGUE isn't as scared of as many things. BUT I am still learning and she communicates great! EXCITEMENT OF THE DAY/ THE POO REPORT.... WRINKLE HAS A PROBLEM-- ACTUALLY 4 TIMES OVERNIGHT-- LAST NIGHT AT TRAINER TALK-- SHE KEPT COMING UP TO MEGAN AND I-- A LITTLE STRANGELY-- AND WE TOTALLY MISREAD HER ACTION --SHE WANTED TO GO OUT... AND WE IGNORED HER--- SHAME ON US !!... WELL SHE CONTINUED OVERNIGHT WITH THE SAME PROBLEM AND TODAY SHE IS ON THE MEDICATION CHART..PANCAKE POOS !!! YOU LET THE LEASH DROOP SLIGHTLY AND IF THE PUP GOES AHEAD AND TIGHTENS IT YOU GIVE A LITTLE JERK AND IMMEDIATELY RELEASE.-- AFTER A COUPLE OF THOSE THE PUP WILL FIGURE OUT THAT GOING FORWARD TOO FAST WILL CAUSE THE ROPE AROUND HIS NECK TO JERK-- SO THEY LEARN...WALK NEXT TO YOU WITH LOOSE LEASH..
THEN A FEW SIMPLE THINGS LIKE "RECALL IN THE KITCHEN" AND OF COURSE THE YUPPY PUPPY.. JUST TO KEEP IT FUN..-- THESE WILL BE ON CAMERA-- AND THE INTERNS WILL HAVE TO RECORD THE PROGRESS-- OR LACK THEREOF....- SO IT SHOULD BE INTERESTING TO WATCH..
AND THEN THE WILDFLOWER AND BEES- WHY DID I NOT THINK WE WOULD HAVE OUR OWN CP EXPERT IN WILDFLOWERS AND BEES??? MARGE !! Here is a very good article you can share. Home Depot labels their plants treated with neonics, but I’m sure there are other stores that don’t. You should always ASK and also buy from small-town local nurseries who carry native plants if possible. Neonicotinoid pesticides were first registered for use in the mid-1990s. Since then, these chemi- cals have become widely adopted for use on farm crops, ornamental landscape plants, and trees. Neonicotinoids are systemic chemicals; they are absorbed by the plant and are transferred through the vascular system, making the plant itself toxic to insects. The impact of this class of insecticides on pol- linating insects such as honey bees and native bees is a cause for concern . I HAVE ALWAYS BEEN VERY SUSPICIOUS OF THESE LOVELY BIG ESTATES WITH NOT A DANDELION IN SIGHT... THEY ARE EITHER LOADED WITH CHEMICALS OF THEY MAKE WINE IN THE CELLAR. THE RUN OFF !!! IF I CAN NOT PASTURE AN ANIMAL WITHIN 100 FEET OF WETLANDS, WHY CAN PEOPLE BUY AND SPREAD CHEMICALS WHICH RUN OFF STRAIGHT INTO THE WETLANDS????? SO WHY ARE WE NOT SPRAYING THAT ALL OVER THE POPPY CROP IN AFGHANASTAN-- IT WOULD RUIN THE DRUG BUSINESS AND THEY COULD HAVE PLENT TO EAT?? at least watching how newscasters tip their heads gives me something interesting to think about during the news. there are a few notable ones that keep thier heads straight..
i don't think the neighbors get to comment on the building-- they are still mad about the driveway...--- i still wave as i go by.. and neither one waves back. i am running out of ideas/and photos to inspire me. they have all sorts of normal photo's on their blog... and wanted some "different " ones from us...i have used several calendar shots..
no succes with walter and noel-- here we go again... they managed a tie on day 9 and 11 but now he is very excited about the project, but he is all action has a faulty delivery system-- which noel finds very tiring ... in the past this has caused us to panic and bring in one of his sons-- grommet who has done a fine job ( grommet x gussie and grommet x opal)----- i think-- as of last night megan and i decided to not bring in grommet and lets see what happens-- if the "little swimmers" last the usual 48 hours-- she should be "covered"
i don't know if that is the reason bees are in trouble.... maybe they don't like purple loostrife. you do realize without bees to polinate we would have very little to eat..... it would take an awful lot of drones to do 1/100000th of what the bees do. i get a report daily from the chicken brick activity-- and even at 78 --- i am recognizing so many new in addition to the regular names... i wish i could send an email to each of you-- but thankfully there are too many !! how is that for a strange statement.? i really appreciate all the cp's who help the new commers to find their way to the chicken bricks- it is our lifeblood-and we have bitten off a huge chunk with 31 to be spayed and neutered while in training..
selling those bricks gives us the courage to put walter in with noel for pups 63 days from now... out best scheme is to breed a female while another is giving birth-- that would be pups every 2 months which is easier to deal with than 31 at once.. noel usually has 3 or 4 pups... a small litter---having said that , she will now have 13.
i have suggested people do not need a car....seeing as at teh moment we have 4 cars reg to sdp... somehow we can manage..
independently because of an illness. In Boston, Mass., we visited a lady whose name is Carlene White. She is raising a therapy dog. She explains that therapy training starts three days after a dog is born. 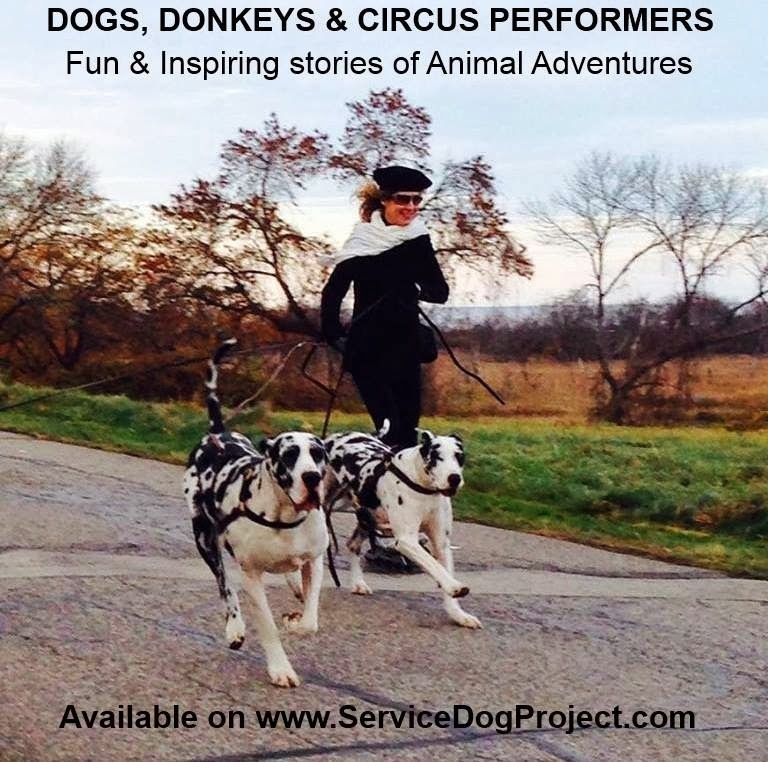 In America, she raises Great Danes to be therapy dogs. However, in Japan they train Golden Retrievers. The reason is that in Japan, people are smaller in size. Great Danes are large, approx. 80 centimeters high. Many American’s are tall and big. They usually need a larger dog for assistance in standing up or walking. This story is about a therapy dog who helps supports a girl in America. This dogs name is George. He is 2 ½ years old. Bella is an 11year old girl. Bella is challenged by an illness. Bella used to be very active. Then when she turned 9 years old, her health started to change and the doctors told Bella’s mom that she has stopped growing. The doctors diagnosed Bella and said she has Morukio “Shokogun” illness (?). Her kidneys did not function properly and could not filter the good and bad bacteria. This illness caused all the joints to stop growing and she became unstable and weak. She could not play with other kids. Her body could not move smoothly. When Bella turned 6 years old, she became so unsteady that the doctors suggested Bella be confined to a wheel chair. She continued to endure surgeries on her neck, leg, and other parts of her body. She did not want to go out, because she could not play with her friends. However, she continued to do her treatments. She was able to do many things, but still could not walk. One day, she saw a handicapped person with a therapy dog. She found a women who trained therapy dogs. It was there that she met George the dog. After she met George, she started to get a more positive attitude and believed she could someday walk again. place with George. One day, Bella started to walk a few steps in the house without George’s assistance. They sleep together in the same bed. Both George and Bella are happy to sleep together. Then a miracle happened! She started walking in the snow by herself! Her dog George just watched her. When Bella’s mom tried to get the dog to help, George pushed her mother away, as if to say, “Let Bella do it on her own”. Also the dog tries to protect Bella. George not only supports her, he also is a good partner and playmate. Bella says “ this dog is my best friend”. She has been with George for 2 ½ years. He has also supported her spiritually. He has made her more joyful. i forget who asked about the dreaming in color- but last night yes-- color... i was trying to take a nap under some bleachers and the blanket was tartan red/green. construction worries today--- we still have some brush to clear somehow- and we need flat-- big machine type flat.... so we can get some seed tossed... i am determined to keep cars from the area by the flag. i have written to the tipi.com which sold me that tipi ( and one other in the past) that cover did not last anywhere near what they said... it began to self distruct very early and was fragile when we took it down and threw it in th e dumpster. i am hoping they will offer to give me a new one....-- i would like to have it set up by the pond-- where i had my origional one...( i hate to admiit it, but i hid an electrical outlet there just in case we needed a bit of modern living in the tipi) . we did have the temp up to 66 degrees one january in frigid weather. we have a whole bunch of new people-- both at stews , applying, volunteering, the chicken bricks ( thank heavens) and more people are reading the daily doggie than ever before.-- i am counting on the old timer cp's to keep the new people going straight... if anyone has any serious questions... please email me directly .... i check that many times a day... especially thoe ones that have DOG as the subject...i can notice those as i whip thru getting rid of the ads for belly fat and job offers. in yesterday's emails i was appalled to have one person appologizing for buying only one brick which was "not up to cp's standaards"
technology---- often at night i wish i could spend the time tryijg to figure out my cell phone, but i live in fear of picking it up and having it decide to call someone who needs their sleep at 2am. it is bad enough that it has total control of the music in my car withut being told... i am getting tired of tom leher music--- which is very enjoyable... but how many times can i enjoy " doin' the vatican rag" or "world war 3 being over in an hour and a half." two people asked who was dealing with dogfest details.... that would be lindak here at this office on days( tu th sat sun) when theresa is not here.--- lindakwiatk@gmail.com,--there is a hotel set up, shuttle arrainged and weekend of food. all organized-- if you will just contact her. and for those who can not come get those spirit sticks in the mail and we will have the usual spirit stick parade... if you haev any suggestiions about dogfest let us know... you should not need to rent a car.....basically the plan is to have the farm just plain open to all cp's to hang out and enjoy the craziness of crazy acres.. hopefully we wil have puppies by then. and... you can pick poo !!!! let us pray..... he has managed 14 and 19 minutes so far... stay tuned.. I AM TOLD VERY FEW DREAM IN COLOR... BUT THAT PILL WAS RED ! THAT WOULD INVOLVE GETTING SOME DIRT...NICE CLEAN DIRT IS EXPENSIVE - AND I REALLY DON'T WANT TO DIG A HOLE HERE... BUT WE COULD--- THEN COVER THE WHOLE THING WITH THE COMPOST PILE, PLANT GRASS AND PRAY THAT BY DOGFEST (SEPT) WE HAVE GREEN. ALL OF THIS MEANS WE SHOULD GIVE STALL MUCKING LESSONS-- BECAUSE THE NEW COMPOST PILE DOES NOT HAVE ENOUGH MANURE-- TOO MANY SHAVINGS TO ROT REALLY WELL. THAT IS THE KIND OF COMPLEXITY THAT IS NORMAL AROUND CRAZY ACRES-- LIKE PUTTING IN THE CAMERAS MEANT MORE LALLY COLUMNS IN THE CELLAR. We wanted to let you know that things for Hunter & Wendy's trip to Washington DC are coming along. Flights are booked, a direct flight from Boston to DC. We have decided to extend our trip a couple days, and would love to meet up with any CPs who are interested. Not sure how to plan it, but we figured you could get the word out and things would work out. Hunter & Wendy are returning to school on Monday, and are trying 3 half days to start. They have been at school this week of vacation practicing the stairs (we know you love to see them do that!) and just getting around to see how Hunter holds up. His gait is slowly getting better, but he gets tired quickly. He is walking differently than before, but Wendy is just happy to have him walking with her and it doesn't bother her. It's only been about 12 weeks since his surgery, and he's ahead of schedule. He will have the wheelchair there if he needs it and they do well with Wendy helping pull the chair. We are sending a quick clip of Team Hunter and Wendy going upstairs (remember only 12 weeks postop)...the going downstairs is still a little scary as always, but they do it. This video has been on Facebook and getting lots of views. The story of Hunter and Wendy in PeoplePets did well too and we were bummed they didn't mention SDP, but when we shared it, we were sure to mention you guys. We are hoping it will get SDP more supporters. Yesterday John and Jess visited a local 1st grade class where John talked about service dogs and Jess, showed some brief video of he and Jess, and answered lots of questions. Jess, who is still timid at the adult day care where John volunteers twice a week, was totally relaxed in this atmosphere. Seems she is more comfortable around children. She was a very good example of a well behaved service dog. How come her tail is down? My dog does that when he does something wrong. If she saw someone else fall down in the mall, would she go over and help them? Does she get to play with other service dogs? We had handouts for each of the kids that talks a little about service dogs, and had info on SDP including both websites. We encouraged the teacher and kids to follow along on line with Crazy Acres in the classroom and at home. John has two more visits to other classes scheduled in the next 4 weeks. SORRY WE DIDN'T GET TO SAY GOODBYE YESTERDAY, BUT WE KNOW HOW BUSY YOU WERE WITH THE GE VOLUNTEERS. WE JUST WANTED TO SAY THAT OUR STAY WAS PLEASURABLE, INFORMATIVE AND A LOT OF HARD WORK WAS ACHIEVED BY ALL. WE WERE AMAZED AT HOW MUCH WORK THE GE PEOPLE ACCOMPLISHED IN ONE DAY. YOUR VOLUNTEERS ARE WORKAHOLICS AND YOU SHOULD BE VERY PROUD TO HAVE THEM ALL. I WAS VERY HAPPY THAT I WAS ABLE TO COOK WITH CAMERA MARK FOR ALL THE GE VOLUNTEERS. IT WAS FUN AND REWARDING AT THE SAME TIME. I WOULD LIKE TO GIVE KUDOS TO YOU, YOUR STAFF AND VOLUNTEERS. WE FELT VERY WELCOME. I LIKED THE IDEA THAT I WAS NOT JUDGED ON HOW I WALKED OR THAT I WAS HAVING A BAD HAIR DAY. I AM GLAD THAT YOU ENJOYED THE PIEROGIS AS MUCH AS YOU DID. I WILL MAKE AN ATTEMPT TO SEND MORE. AGAIN, THANK YOU TO EVERYONE AT SDP FOR YOUR KIND HOSPITALITY AND ALSO FOR MAKING US FEEL WELCOME AND ALSO TO THE EXCEPTION THAT YOU MADE FOR US. I NOW HAVE 2 DOGS SNORING ON THE SOFA. for once in my life.... i did not fear the arrival of teh police-- whch happened mid morning... the neighbors are furious that i want to use my driveway-- which is basically my right of way- -- i had it surveyed and flagged ( at great expense...) and hired DODGE TREE a certified arborist to cut trees etc..-i have never seen so much equipment a bucket that would go up 80 feet... a truck for carrying logs - and the most amazing chippers-- the small chipper would take trees up to 8 inches diameter... and the big chipper 20 inches... that is a huge tree.. blowing shavings into the rest of teh woods...--- they also had a cat and a small escavator.. along with 2 huge dump trucks.--------it is cleared..it is also bumpy with stumps etc..
while all that was happening 25 general electric engineers who usually build jet engines.. pounded stakes for the perieter fence whild 5 of them took on the job of producing a portable chicken coop.. problem is another 25 are due back here in about an hour to do more of the same. i happened to mention the bay state trail yesterday and someone got back withteh idea of a boyscout troup connecting us to that trail... which would give us the 45 minute walk from a field to the back of the pond... that would be wonderful for the bvolunters to walk dogs. CARLENE- The opening of the access to the bay state trail would make an awesome project for an Eagle Scout. I am sure that there are scout troops in your area that would need ideas for scout projects. and I’m absolutely fascinated by what you are doing. like to print one or two pictures of Great Danes at work in our magazine. Please give me your permission! And please send me some pictures of the Danes or can I copy them from your website?? fascinated by your project as I am! I have one question: do you keep in contact with your Danes? So you always know that they are all right? years and older and bloodlines with Danes getting 6 or 7 which is nothing. from the poo picker collection..
a properly trained human can be a dogs best friend. I NOW KNOW WHY WOMEN MAKE 79 CENTS FOR EVERY $1 MEN MAKE-----..PARTIAL VISION------.I HAVE BEEN WATCHING ALOT OF TELEVISION LATELY AND THE NUMBER OF WOMEN WHO'S VISION IS IMPAIRED BY A HANGING BIT OF HAIR IS ASTOUNDING. IN KEEPING WITH SOME FASHION STANDARD....TOO MANY WOMEN HAVE ONE STRAND OF HAIR BLOCKING PERIPHERAL VISION WHICH TEHY THEN SPEND TIME FLIPPING BACK OR TRYING TO SHAKE IT BACK BY SNAPPING THIER HEADS SIDEWAYS. EVENTUALLY THEY HAVE NECK TROUBLE AND HAVE TO RETIRE. MEN HAVE HAIR ½ INCH LONG-- OR SHAVE THIER HEADS AND GET RID OF THE PROBLEM ENTIRELY. VERY FEW HAVE "FLUFFY HEADS"
MATH IS TO ARITHMETIC AS PHILOSOPHY IS TO SPELLING.... WHY IS LOGIC NOT "TAUGHT" IN OUR SCHOOL SYSTEM...--- BASIC LOGIC IS MISSING IN MOST TEENAGERS HEADS ANYWAY... BUT THEN THEY GROW UP TO VOTE. "THE VOTING RULES HAVE BEEN THAT WAY FOR DECADES"--- IS NOT AN ANSWER TO **** WHY? ****WHY NOT HAVE 2+2=4.----DID I HEAR THAT NEW YORK ONLY USED NORMAL MATH IF THE VOTING IN 8 COUNTIES FOLLOWED A CERTAIN PATTERN??? WHY DID SOMEONE --100 YEARS AGO-- DECIDE TO MAKE THAT "RULE"....- IF NOT TO CONTROL THE OUTCOME OF A CERTAIN ELECTION...I CAN UNDERSTAND THAT THE SMALLER STATES HISTORICALLY NEEDED TO OVERCOME THE MASS THAT IS NEW YORK. BUT WHY GET DELAGATES INVOLVED WITH SIDE SWAPPING. ?- THERE IS SOMETHING IN ME THAT SAYS A MAJORITY IS A MAJORITY ESPECIALLY NOW THAT THE ENTIRE COUNTRY- WITH FEW EXCEPTIONS ---TWITS. GENERAL ELECTRIC VOLUNTEERS ARE ABOUT TO ARRIVE... AND THEY DON'T FOOL AROUND... THEY WORK...- I THINK I HAVE ALL THE PIECES IN PLACE FOR FENCING-- AND A SECOND PROJECT OF PORTABLE CHICKEN COOP BUILDING. IN ALL OF EASTERN MASS I COULD FIND ONLY 2 ROLLS OF 6' --- 3 ROLLS OF 5' ---AND ALOT OF 4'--- THE LAST PROJECT HERE TOOK 12 ROLLS AND THE TRACTOR STORE DID NOT REPLACE IT. WE WILL MANAGE... BUT I NEED TO BE OUT THERE KEEPING THE 6' IN PLACES WHERE THE STROLLING PUBLIC MIGHT TRY AND GET INVOLVED WITH PATTING DOGS OR HORSES...-- I ALLOWED A 3' PATH TO BE OPEN TO ALL TRYING TO GET TO THE STATE FOREST BEHIND US. IT IS NOT USED ALOT... BUT A FEW. THIS WHOLE EFFORT WILL ELIMINATE ALL THE PARKING BETWEEN BARN AND T TENT.-- SO THAT CAN BE THE "PLAYGROUND" FOR PEOPLE AND DOGS IT WAS INTENDED TO BE. I HAve a COLLECTION OF STILTS WHICH WE HAVE NOT GOT OUT YET...- THERE HAS NOT BEEN ROOM..
AND WHY SHOULD KIDS NOT BE ABLE TO JUGGLE? THINGS LIKE THAT AT STEW.... I COULDL AWARD A CHICKEN BRICK TO ANYONE WHO CAN JUGGLE ----- I SUPPOSE 2 BRICKS FOR JUGGLING 4 ITEMS.-ROLLED UP PAIRS OF SOX ARE GOOD. GOING OUT OUR GATE IN THE "A" FIELD WOULD CONNECT US TO THE BAY STATE TRAIL-- WHICH GOES FROM CAPE COD TO CAPE ANN-- WOULD BE A GREAT PROJECT FOR SOME CP'S TO CLEAR THAT ACCESS.. WOULD BE A GREAT DOG WALKING PLACE... WHEN WE FIRST MOVED IN HERE I HAD A SMALL BULLDOZER JUST PUSH THRU TO THE TRAIL.... BUT THAT HAS GOT OVERGROWN...-- COULD BE REDONE"BY HAND". THEN THERE WOULD BE A 45 MINUTE LOOP AROUND TO THE GATE BY THE POND... ONLY JANINE KNOWS THE WAY NOW. I NEED TO TALK TO KITTY ABOUT LABELING NEXT YEAR'S CALENDAR'S 19TH DAY "RANDOM ACT OF KINDNESS DAY"
WHEN I DROVE THE 8 DONKEYS- THERE WAS NO SHORTCUT I WOULD TAKE AND HAVE ANYONE SAY 'THEY ARE JUST DONKEYS"-- I LIVE NEAR A VERY EXCLUSIVE ( AND EXPERIENCED ) HORSE DRIVING CLUB--- THE KIND THAT FLY THEIR HORSES TO EUROPE TO COMPETE INTERNATIONALLY.. ALL DRESSED PERFECTLY. OR SHOULD I SAY "ATTIRED"
WHEN I WAS DRIVING 4----I WENT THERE- AND SAM WAS DELIGHTFUL AND SAID HE WOULD TAKE ON THE CHALLANGE FOR ME-- WHICH HE DID AND MADE ME A HARNESS FOR 4 WHICH WAS BETTER THAN ANY COACH LEATHER PRODUCT AROUND- EVERY PIECE WAS FINISHED TO PERFECTION... AS I GREW FROM 4 TO 8, I WENT BACK AND SAM WAS NO LONGER AROUND-- SO SOMEONE IN HIS PLACE MADE THE NEXT 4 FROM SAM'S NOTES.. I BORROWED THE HARNESS BACK FOR THE 2013 CHRISTMAS SHOT OF THE DOGS IN SANTA'S HARNESS. EACH HARNESS WAS IN IT'S OWN BLUE RUBBERMAID BOX--- I WAS VASTLY FAMILIAR WITH THAT HARNESS'S DETAIL HAVING SPENT DAYS CLEANING IT FOR PERFORMANCES -- IT TOOK 8 HOURS MINIMUM.. SO WHEN I WENT TO RETURN IT, I HAD TO CLEAN IT AND PUT IT BACK TOGETHER--- CORRECTLY WITH EACH PIECE OF THE HUNDRED PARTS WITH THE CORRECT HARNESS. I LET THEM DRY ( LEATHER IS NOTORIOUS FOR MOLDING) CAREFULY PLACED THEM IN THEIR PROPERLY LABELED BOXES FROM DONQUI TO LEROY. THERE IS A LARGE POSIBILITY THAT AFTER I CLEANED IT , SOMEONE - JANINE- TOOK IT ALL TO WENDY'S --OR MEGAN NEEDING IT OUT OF THE WAY- STASHED IT NEATLY SOMEWHERE ELSE. WE NEED TO FIND THAT HARNESS TODAY-- IT IS DRIVING ME NUTS... IT IS ALSO A $9000 PILE OF HARNESS... I DON'T YET KNOW IF WENDY IS MISSING HER'S TOO OR IF SHE HAS ALL 8-- I AM SURE IT IS A SIGNIFICANT LUMP IOF BLUE BOXES.. SO EVERYBODY ON THE PROPERTY.... THAT IS TODAY'S ISSUE. -A girl in my neighborhood asked what kind of dog he was and what he was doing. My mom was with us and explained that he's working and he helps me walk. She said, "Wow, that's a really helpful dog!" -Walking past a conference room at work, I overheard "He is just SO well behaved for her." -Stopped at a stoplight (windows up), a guy on the sidewalk waved and shouted "Hey lady! You've got Marmaduke in the back of your car!" like I didn't know...?! -Another woman at work who sees us all the time said "You guys just make everybody smile!" cakes got out.... i know i got mine out-- to georgetown-- they were shocked... beautiful lemon /whipped cream monster cake..
i am delighted to provide the opportunity !! In case you didn't see - I wrote this in chat. I'm having so much fun doing this. A very rewarding Appreciation Day. We got our cake delivered to the Fire Department District 4 of Cottleville, Missouri. This was another group of three men than last time. They heard about the prior cake being delivered and were very happy to be this month chosen three. We were again invited into “their home” and greeted with open arms. Sit down at their table, chatted and took pictures. Oh, and the flyer from last time was on one of the three refrigerators and when I gave these three a flyer, they attached it to the front of THEIR REFRIGERATOR. They were thrilled, as was I. We left with happiness in our hearts for doing something that was appreciated. In honor of "cake day" for SDP Gary Dumas and I decided we were going to bring a cake to Brittany a Walmart manager at the Plymouth NH store. About a month ago I had an issue with a women there who was a shopper ( some of you may remember the story) but I felt it was important that Brittany was recognized for her effort to deflate the situation and make me and my family feel comfortable. I also learned today talking with Brittany that her husband is a veteran and he has a service dog and when she was a child she had a service dog for a short time for epilepsy. She knows the importance of these dogs more importantly she understands and for that I thank her ! and i know those GE people are super fence putter-inners. if the puppy hill camera swings that way, you might see us moving that fence over 3-4' to make the "drive thru" a little more generous. i went thru with the tractor and was very nervous-- the 5' bucket had inches to spare. Today, in almost two years I started to jog again. I know this is all due to having Emmett. He has given me back my confidence. I don't jog with him but I leave him with someone at home. I use a modified baby jogger to jog with but hopefully someday soon it will be with Emmett. puppy hill camera and see what happens when they see it. which started me thinking... children don't seem to relate to the cost of things in time. or they-- would have to work to pay for those. now the same "seconds" are $39.99 and the minimum wage is gone up to $7.50---- flipping hamburgers at mcD's for 1.5 hours is reasonable--if they have to flip for over 5 hours to buy seconds-- it begins to eat into their food and housing budget..
which is why many college grads live at home.-- refrig access. SOMEONE SAID SCRUFFY'S BACK LEG WAS ACTING DIFFERENTLY.... I WILL WATCH TODAY.... BUT....BOTH MAUDE AND SHAG HAVE A BIT OF "STRING HALT" I.E. WIERD BACK LEG ON OCCASION... EXEGERATED LIFT UP AND SOMETIMES HESITATE BEFORE LOWERING IT AGAIN.. STRING HALT DOES GOOGLE- AND THERE IS A VIDEO OF A PERFECT CASE.. I HAVE FORGOTTEN WHAT ANYONE DOES ABOUT IT... IF ANYTHING... ON PET HORSES ETC-- I BET YOU JUST LIVE WITH IT. LAST NIGHT SHANNON WAS SOMEWHERE AND SAW CHOCOLATE NECCO WAFERS- AND she REMEEMBERED MY SISTER- FRAN - IN COLORADO LIKED THE BROWN ONES.. SO SHE BOUGHT 2 ROLLS FOR HER. SHANNON DOESN'T KNOW FRAN - OR ANYTHING ABOUT HER EXCEPT SHE LIKES BROWN NECCO WAFERS. EARLY THIS MORNING FRAN CALLED TO SAY HER HUSBAND HAD PASSED LAST NIGHT AFTER MANY PAINFUL YEARS WITH ALTZEIMERS. "I CAN EXPLAIN IT TO YOU , BUT I CAN'T UNDERSTAND IT FOR YOU..."
lots of interesting people showed up yesterday for stew.. 32 cars-- i counted... well they ought to fit in the new area which will get serious attention for the next 10 days... between tree guys and the GE volunteers..
most significant progress is .....i must away to the dump-- the dump trailer has been full for weeks now-- and we have moved 5 sofas out of the G-tent -- which is now quickly becoming a lumber yard as we stash lumber for chicken coops and "outback" stalls. so now the place really does look like "cannery row"
best laid plans of mice or men--- ryan just called and will not be in today--i really can't go to the dump alone because if the dumping trailer decides not to go up and slide stuff out... i can not cope-- i hate to admit it. so we may not have a field of daisy's- but rather a field of sofas and cushions and bent fences for a while. strange thing of the day....--- lahey hospital/clinic/whatever--- big place---- i have never seen a child there... .. active emergency room and things like that--- no kids-- as a matter of fact i can't remember seeing anyone under medicare age.... they are super computerized... huge place...... ?target audience is the grey hair bunch? another strange......and by no means do i mean to promote trump--- but if voting got so twisted up that it is possible to get the popular vote and loose the election--- it offends me-- why should anyone have to explain who you are actually voting for when you make an x in a box. i think before the next election we might ask of each state exactly how this works....don't tell me anyone made these rules up to be fair-- why would anyone make it different than 1 vote for 1 person except to pull some shenanigans . just because it has been that way for 100 years-- or we elected lincoln with these rules--- that still does not cut the mustard. i do not like "here is an answer just take it and move on"------ i have been concerned about this for years--- which is why i bought the florida voting booth.. what a marvelous mess that florida episode was-- from standing in line 4 hours to vote to the bifocals and the hanging chads to hackng computers counting votes. i am not happy. AND CAMERA MARK... WHO COOKS THINGS AND HIS CAR IS LOADED TOO... OTHER THAN THAT.. NO CARS ( AS SOON AS WE GET IT DONE.). Sorry we haven't been able to visit lately. Ava and Cindy are doing great. Ava has gotten her s#%& together. She goes everywhere with Cindy, and Cindy is loving the renewed independence. We went to the support meeting today and Jack and Emmett were there. The two dogs lay nose to nose for most of the meeting and were wonderful together, so well behaved. Jack stopped here on the way home and Ava and Emmett got to run and play in the back yard. Jack said he'd be posting photos. The father of one of my students told me the following story. His wife was friends with one of our neighbors who keeps horses on their property. She's a seasoned rider and on a visit one day, rode one of their horses out on the trails behind the house accompanied by their miniature donkey. There are about 300 acres of criss-crossing trails back there. At some point during the ride something spooked the horse which threw the rider. She struck her head in the fall. After a while the others back at the house became concerned when she hadn't returned. Just as they were considering a search she emerged from the woods, barely conscious, leaning on the donkey. They tended to her, calling the ambulance, she was hospitalized and later said she was too disoriented from the concussion to find her way back. The donkey had led her home. Shortly after the ambulance took her to the hospital the owners realized the donkey was missing. About five hours later it returned, leading the horse back to the stable. This is, all in all a pretty good testimonial to the intelligence of miniature donkeys. I HAD INTENDED TO USE "MY DRIVEWAY " #45 WHICH IS BEHIND THE ARENA-- BASICALLY A 20 FOOT RIGHT OF WAY TO THE STREET .. -----ON MY DEED SO I CAN GET MY CATTLE TO THE POND FOR WATER... WHEN WE WERE JUST STARTING, THE NEIGHBORS ON THAT DRIVEWAY APPROCHED ME PLEASENTLY- BUT NEGATIVELY ABOUT USING THAT DRIVEWAY-- SO I OPTED NOT TO OPEN IT AND USE IT ALL THE TIME--- THO I WAS CAREFUL TO USE IT AT LEAST YEARLY JUST TO STAY IN PRACTICE.. THE PROBLEM IS-- THE FLAT FIELD FENCE--- IF WE MOVE THAT OVER ABOUT 4 FEET, WE COULD UTILIZE ANOTHEHR ½ ACRE WHICH IS ADJACENT TO THE CEMETARY AND OFF DRIVEWAY #37 AND HAVE A DRIVE THRU-- IT WOULD SAVE A COUPLE MORE BIG TREES -- I MEAN BBBBIIIIGGGG . 90 FOOT TALL ONES..
RYAN HAS IT NICELY CLEARED AND CAN GET THRU WITH THE TRACTOR ( 5 FOOT WIDE) ANOTHER 4 FEET WOULD MAKE A HUGE DIFFERENCE.. AND TEH FLAT FIELD WILL NEVER MISS IT.. SO WE/THEY WILL MOVE THE FENCE. THEY WILL ARRIVE WITH WOOD CHIPPER ALSO-- RRREEEAALLLLY CRITICAL CHIPPING BECAUSE WE HAVE ALREADY CUT THE SMALL STUFF TO GET /FIGURE OUT WHAT TO DO NEXT.